With only four goals in their last five games, it appears that the Oilers might be having some scoring issues at even-strength. The good news is that the team still ranks 9th in the league when it comes to goal-share, as they’ve outscored opponents 103-94. And they rank 11th in the league when it comes to their goal-scoring rate, sitting just above the league average with 2.35 goals per hour at even-strength (5v5). 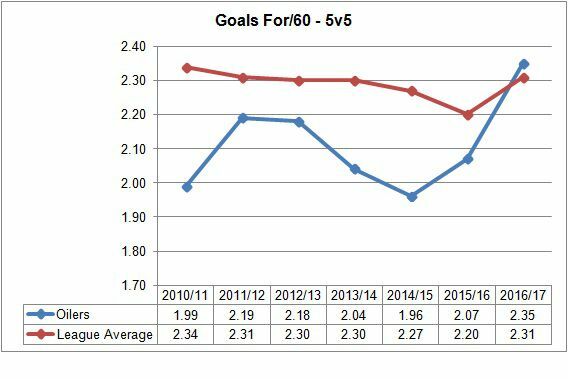 The Oilers offensive outputs have been a big improvement from years past as the clubs rate of goal scoring was typically below the league average and often near the bottom of the league. What’s also been encouraging is that over the course of the season, the Oilers rate of goal scoring has remained pretty steady, even up until now. Over the past 25 games, the team has seen their rate of goal production dip just below the league average of 2.31, but it doesn’t appear here, at first glance, that there are major issues. Now a big reason for the Oilers offensive output this season has of course been Connor McDavid. When he’s been on the ice, the Oilers create a lot more offence and scoring chances, and have generated 3.11 goals per hour. Without him on the ice, the Oilers rate of goal scoring drops significantly to only 1.96 goals per hour, which is around what Buffalo (1.96), Arizona (1.91) and New Jersey (1.91) are currently generating as a team this season. 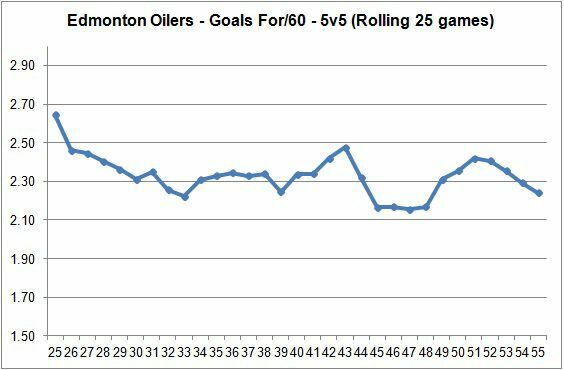 It doesn’t help that the Oiler forwards paid to generate offence are struggling all at the same time. Players including Milan Lucic, Jordan Eberle, Ryan Nugent-Hopkins and Benoit Pouliot, all of which are experienced NHL players with past success, are below their historical averages when it comes to goal scoring and point production. If the Oilers intend on being a playoff team, with championship aspirations, they will need to find a way to generate more goals, especially with McDavid on the bench.